(Nanowerk Spotlight) As we have show before, nanotechnology applications could provide decisive technological breakthroughs in the energy sector and have a considerable impact on creating the sustainable energy supply that is required to make the transition from fossil fuels. Although we love to write about all the clean and green applications that will be nanotechnology enabled, the harsh reality is that dirty energy is still fuelling our way of life. No matter if you are a member of the "drill, baby, drill" crowd or if you are actively involved in saving energy and think that the development of renewable energies can't come fast enough, we have to live with the fact that the world's energy production will continue to depend on oil, gas and coal for quite a few more years. But even here, nanotechnology applications might offer some improvements. A new report shows that nanotechnology, in the form of carbon nanotube (CNT) rubber composites, could help to significantly enhance oil production efficiency by allowing to probe and drill deeper wells. This in turn might allow to better exploit existing oil fields and maybe weaken the argument for new drilling in environmentally sensitive areas. While there is a hot debate going on if the world is close to, or already has reached, "peak oil" – the time when global oil production begins a terminal decline – oil companies today are faced with increased production difficulties. The problem is that the oil and gas industry has already picked much of the low-hanging fruit when it comes to exploring oil reservoirs. Much of the remaining oil resources will have to be produced from increasingly difficult to recover residuals – primary recovery can typically extract only 10% to 30% of the oil in place – and in deeper and less accessible reservoirs. If you are interested to learn more, the International Energy Agency has produced a publication ("Resources to Reserves") that identifies challenges and key technologies being investigated in the exploration, production and transportation of oil and gas. Some of the technical challenges in recovering untapped oil resources have to do with the extreme heat and pressure that oil drilling equipment is exposed to when certain depths are reached. One of the materials that is being stretched to its limits in extreme conditions is rubber. Rubbers are almost exclusively used as a sealing material in oil probing and excavation, typically as O-rings and sealants between the various joining modules of a drill or probe. Modern rubbers' performance limits are typically reached when temperatures exceed 200°C or pressures go beyond 200 MPa and commonly used O-rings in oil exploration operate under typical temperatures and pressures such as 175°C and 135 MPa. Formulating rubber that has the ability to withstand higher temperatures and pressures has been a serious technological challenge in oil & gas exploration. "Generally, carbon black-filled fluorine rubber has been used as a sealant in oil exploration to date" Dr. Morinobu Endo explains to Nanowerk. "Although several papers regarding carbon nanotube-filled rubber composites have been published, no one – to the best of our knowledge – has found a way to significantly improve the heat resistance and durability of carbon nanotube/rubber composites. This has been due to the great difficulty of dispersing carbon nanotubes homogeneously, and the lack of strong binding interactions between the filler and the rubber matrix." In order to accomplish the homogeneous dispersion of carbon nanotubes within the rubber matrix, Endo and an international team of collaborators developed a milling process at low temperature to get enhanced elasticity and shear force. The result is an extreme-performance rubber nanocomposite material that is able to withstand temperatures of up to 260°C and pressures as high as 239 MPa. 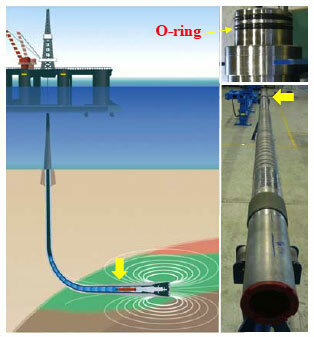 "Based on our team's estimate by surveying the depths and temperatures of oil resources, the development of an extreme rubber sealant having the enhanced performance of 100°C higher temperature and 70 MPa higher pressure durability, as compared to those of the currently used O-rings, will contribute to doubling the current average oil recovery efficiency by incorporation with other related technological innovations" says Endo. Endo, a Professor of Electrical & Electronic Engineering at Shinshu University in Japan, collaborated with professors Kenji Takeuchi, Takuya Hayashi, and Yoong Ahm Kim from his university as well as Mauricio Terrones from IPICYT in Mexico, Mildred Dresselhaus at MIT, and scientists from Nissin Kogyo, Schlumberger, and Fukoko. The team published their findings in the October 21, 2008 online edition of Advanced Functional Materials ("Extreme-Performance Rubber Nanocomposites for Probing and Excavating Deep Oil Resources Using Multi-Walled Carbon Nanotubes"). The scientists point out that the use of their novel CNT/rubber nanocomposite material is not limited to oil exploration but could be suitable for a wide range of innovative applications ranging from factory tools to environmental applications to aerospace and space technologies. To develop their rubber nanocomposite, the researchers used a low-temperature roll mill process to disperse multi-walled carbon nanotubes in a synthetic rubber matrix (Fluoroelastomers/FKM). Endo explains that the three key issues in making the nanocomposite are the use of of multi-walled carbon nanotubes embedded in fluorinated rubber, the surface modification of these nanotubes, and the formation of a cellulation structure in the composite. In order to accomplish the homogeneous dispersion of carbon nanotubes within the rubber matrix, the team developed a milling process at low-temperature to get enhanced elasticity and shear force, where the temperature of the roll mill was maintained at less than 20"C. Endo explains that this process allows three important things: "1) the elastomer molecules of the matrix to fill the voids created by the physically intermingled nanotubes, thus breaking effectively their intrinsic agglomeration during the mixing process, 2) the rubber matrix to exhibit good wettability with carbon nanotubes, and 3) the rubber matrix to display extreme elasticity." To demonstrate an innovative end-use based of their novel nanocomposite, Endo and his collaborators developed a rubber sealant for oil exploration and probing purposes, which is applicable under extremely harsh conditions. 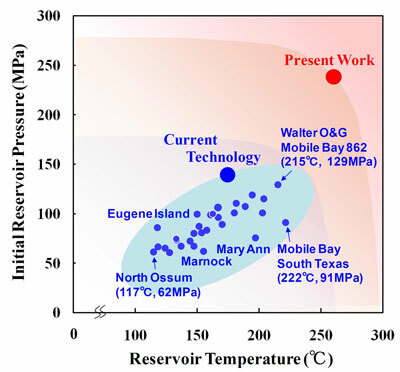 Testing their nanocomposite O-rings, they found that they exhibited higher pressure-resistant properties when compared to conventional sealants by about 80?100 MPa higher pressure, which corresponds to a much deeper depth in water of 8000 meters. "Our experimental system was limited in its ability to simulate further extreme conditions, but we believe that our new rubber composite may actually exceed our claims" says Endo. He cautions, though, that they have not yet developed an effective mass-production technique for this CNT/rubber nanocomposite, so practical applications may have to wait a while.